Installing plain architrave is a very elegant way of finishing an interior. The clean-lines and ’uncluttered’ look provide a perfect border for both modern and traditional interiors. Because of the versatility of plain architrave styles, to some extent you can ‘future proof’ your home. By opting for something in this range over a more stylised alternative, it will more than likely remain suitable should you update the décor in the room so you won’t have to update the architrave in this instance. Some internal doors are positioned so close to an adjoining wall that there is not enough space for standard-width architrave. Oftentimes in this situation the solution would be to install architrave on one side of the door only. 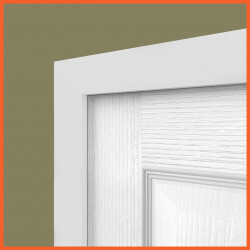 With the plain architrave profiles we are able to offer a greater range of widths. 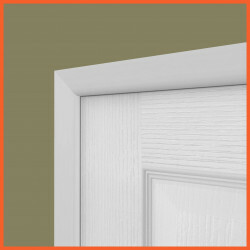 There is an option to order plain architrave in 50mm or 60mm widths which can help to overcome the problem of door positioning. As with the skirting boards of a similar style, the plain architraves tend to be more hardwearing than the more detailed profiles as less of the MDF is cut away when creating the moulding. This is particularly advantageous in the busier areas of the home, as their inherent durability means they are likely to last longer without the need for replacements. Bullnose architrave is widely used and is one of our more popular profiles. With a single, simple radius the bullnose architrave provides a crisp clean finish that will never go out of style. The bullnose is low maintenance, easy to clean and versatile enough to compliment any interior.